Doggerland is the name given to an area of land that connected the UK to mainland Europe which up until about 6,500 years ago was habitable. Due to changes in sea level between 6,500 and 6,200 BCE, the land was submerged and now lies beneath the North Sea. 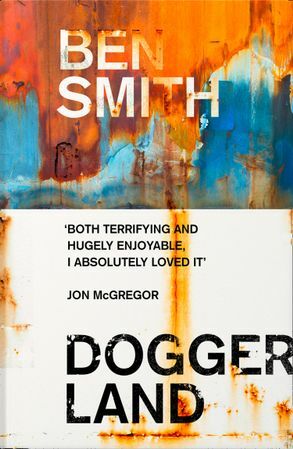 Doggerland, Ben Smith’s debut novel, is set just slightly in our future (or perhaps an alternative present) and now that area is one of seemingly endless fields of rusting wind turbines rising above the waves. In the middle of these fields is the rig on which a boy (only named once as Jem) and an old man (also only named a couple of times as Greil) live. Their job is to keep the slowly failing wind farm operating by repairing the turbines. The boy uses a string and homemade hooks to fish from the rig but never catches anything living and the pair live on tinned food so glutinous that the boy sometimes uses it for patching holes in the rig. The old man spends his spare time dredging the sea floor for evidence of the past inhabitants on the area. The two have a love/hate relationship having to rely on each other but both keeping secrets from the other. The world in which the boy lives is a cold, storm tossed North Sea with rusting wind turbines stretching out in every direction. The whole grid is slowly failing, more so as they strip out good parts from working turbines to trade for goods and information from the man who brings their supplies. The boy is only on the rig because he was required to fulfil his father’s contract with the company. The boy’s father disappeared from the rig years before and the boy dreams of escape. When the supply boat comes he is encouraged to make his own bid for freedom. But nothing is that easy. This is not your standard dystopian or post-apocalyptic fare. It most resembles a Beckett play given the limited setting and the lack of any broader social interaction outside of that between the boy and the old man (and briefly the man who brings their supplies) and their seemingly inescapable situation. That relationship between the boy and the old man in a blighted landscape also has echoes of Cormac McCarthy’s The Road. Doggerland is possibly a dystopia – clearly a society in which children have to fulfil the contractual obligations of their parents is not a great one, but we learn very little about the society that the characters come from other than this. And the North Sea is an inhospitable place to live at the best of times, but the reader is given little evidence to assess the state of the rest of the world. Given the lack of reference to the rest of the world, there is little to draw from besides the existential terror inherent in the closed-world scenario. The whole amounts to a journey into an unforgiving landscape with reliance on a fragile human connection to get through the monotonous days. Smith effectively explores that connection and some passages, particularly around a days-long storm, are particularly effective and haunting. But this is ultimately a bleak journey.